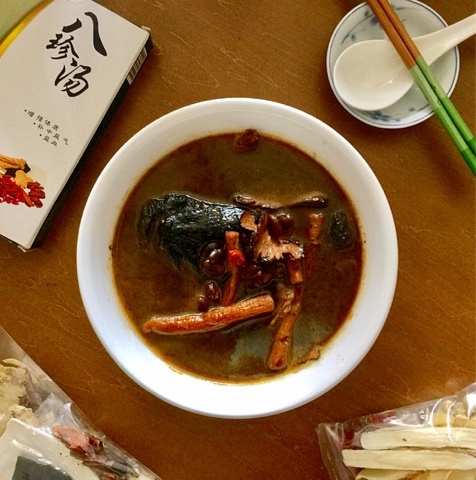 How to cook Ba Zhen Soup with Black Chicken? 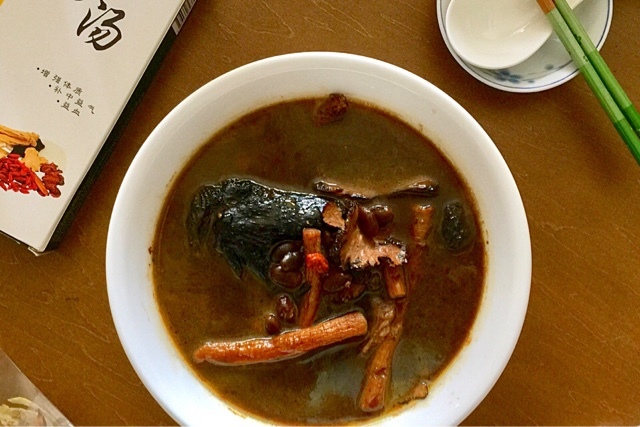 This recipe passed to me by my TCM physician is delicious and brings much comfort to the soul. Ba Zhen Tang is famous among ladies to replenish their blood after every monthly loss. Normal people are advised to drink this on the second day after their period has completely ended. As mentioned before, I visited a Chinese Physician because I felt tired and cold easily. On top of that, I also experienced lower backache. If I had visited a Western doctor, he probably would roll his eyes in his heart and prescribe some vitamins. I need to explain my condition because if you follow the recipe, I am not sure if Ba Zhen Tang is too heaty for you. I bought the black chicken from the wet market and the auntie helped to remove the skin. I washed the chicken and poured boiling hot water over it to kill the germs. You can purchase Ba Zhen Soup ingredients easily from any medical halls or even some NTUCs. I discovered that Ba Zhen Soup ingredients from Eu Yan Seng and ZTP medical hall are more delicious than other medical halls. 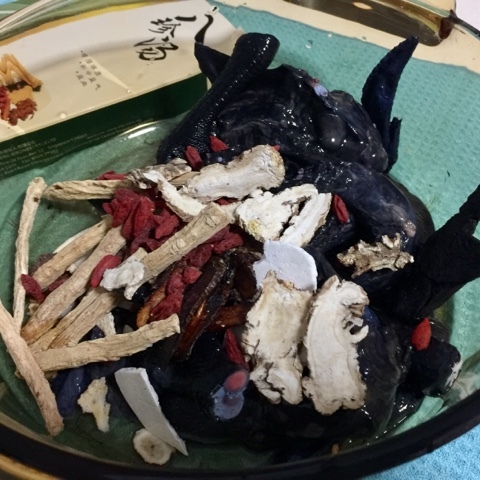 For Chinese herbs, there is no need to wash. If you have a phobia of possible dirt, just lightly rinse them. The additional ingredient my TCM Physician asked me to add is Black Beans! She said that black beans are very good for women. 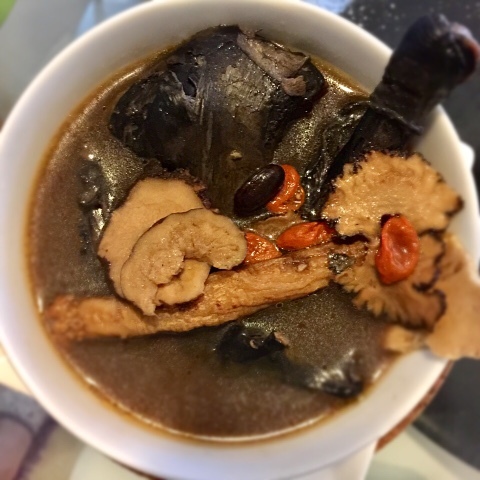 I believe it was the nutty fragrance of the black beans, combined with the essence from the black chicken, that made the soup so deliciously sweet. I placed the chicken, herbs and beans in a Vision glass pot and filled it with tap water. Caution: You cannot use metallic pots to cook soup. I followed my Physician's instructions and boiled the chicken with the herbs for around 40 minutes to an hour. The result of my hard work was a bowl of soup nourishing my body, mind and soul. Cafe Mosaic at Carlton Hotel - 1-for-1 Buffet 2018 for OCBC, UOB and DBS Card Members! Starker Q @ Punggol - Freshly Brewed Beers, Cheap Food Stalls & Live Band! Tang Tea House at Jalan Kayu - Halal Chinese Food: Dim Sum and Zi Char! Seoul Part 5 - Gwangjang Market, Dongdaemun late night shopping and Korean Spa! "Be a Pineapple: Wear a Crown, Stand Tall and be Sweet on the inside."